Since 2005, New England Mechanical Overlay, Inc. (N.E.M.O.) has specialized in industrial boiler repair, corrosion resistant overlay, power plant maintenance, pipe fitting, shop fabrication and other field specific services. New England Mechanical Overlay is on call 24/365 for emergency boilers and mechanical repairs. With a seasoned road crew and a fleet of custom trucks, NEMO is prepared to respond to your emergency quickly and get your plant or facility up and running with as little downtime as possible. New England Mechanical Overlay has been maintaining America’s power plants since 2005. A well-maintained boiler or pressure vessel can avoid costly repairs in the future. 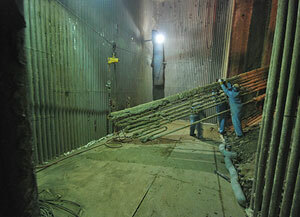 NEMO’s team of expert welders can inspect your system and advise on future repair and maintenance. A schedule of regular maintenance keeps your pressure vessels working at the optimal level with minimal downtime. Be proactive with your maintenance and minimize downtime by scheduling routine boiler inspections and UT profiles with Harvard NDE. 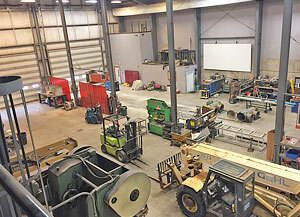 The NEMO Fab Shop is a 6,000+ square foot shop in Pittsfield, New Hamphire that specializes in ASME tank design and fabrication, as well as power and process piping. 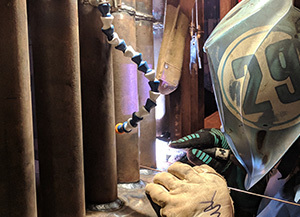 In addition to tank and tank related fabrication, the NEMO Fab Shop is capable of fabricating a wide variety of other industrial projects including structural and mechanical. The NEMO Fabrication design team can work with you to create fabrication drawings of your tank that meets compliance and certification requirements with supporting calculations and material specs. You will save time and money by using NEMO’s in-house industrial coating services to meet your exterior paint requirements. ND Examinations are performed by our sister company, Harvard NDE. New England Mechanical Overlay employes over a 100 certified welders across the country with the capability to send a team to your location for repairs, scheduled maintenance, or emergency services. 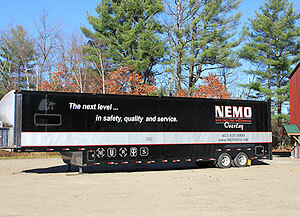 NEMO’s fleet of customized tractor trailers is equipped with an inventory of tools and equipment selected specifically for your job.